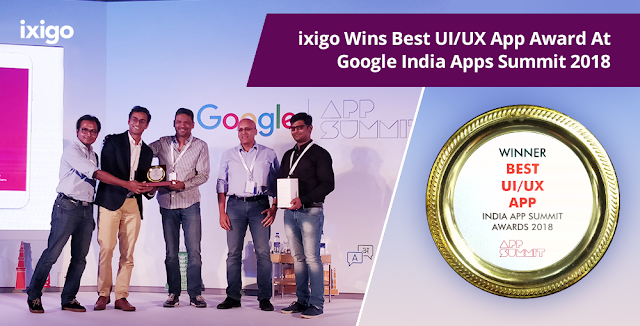 New Delhi, May 30, 2018: ixigo, India’s leading travel search marketplace, has bagged the ‘Best UI/UX App’ for its flights app at Google India Apps Summit 2018 held in Bengaluru on the 29th of May. Honoring creativity, innovation, design and user experience in app design, the Google India Apps Summit awards are chosen by a panel of industry experts after a thorough evaluation and app review. ixigo has been a leader in innovation in the travel-technology category in India with several global industry-firsts such as instant booking across all major OTAs & airlines, fare predictions for flights, PNR predictions for trains, personalized fare tracking, auto web check-in, instant fare alerts and India’s first AI-based personal travel assistant.